Today I found out how trick candles work. There is nothing more humorous then seeing a person become woozy and light-headed at a feeble attempt to blow out candles that fight back! Candles themselves work on a fairly simple and ingenious principle. The three elements to sustain fire are concealed in one convenient package. The fuel itself is the container made of wax. The catalyst that heats up the fuel is the wick. Once lit, the wax that is surrounding the flame melts and is drawn into, and up the super absorbent wick. The closer the wax gets to the flame, the hotter it becomes. By the time it reaches the flame, it is hot enough that the wax vaporizes and it is the wax vapor that burns. The oxygen it needs is ever present in the air at approximately 21%. There are several types of waxes used to make different types of candles. The most popular are; Paraffin, Beeswax, Tallow, Bayberry, and Soy. Because it is a byproduct of crude oil and can be manufactured to have several different melting temperatures, often at lower costs, the most commonly used type candle wax is paraffin. Low melting paraffin has a melting point at or below 130 degrees Fahrenheit. Medium melting point paraffin melts between 130-145 degrees, and high melting point paraffin melts between 145 and 150 degrees. The higher the melting point of paraffin, the harder and longer lasting the candle wax is. 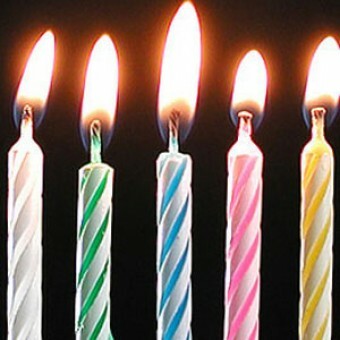 Almost all trick candles are paraffin wax candles. So why is it so hard to blow out a trick candle? When you blow out a normal candle, there is a small ember inside the wick itself that continues to burn. This ember is hot enough to melt the wax, but not hot enough to ignite the vapor and continue the burning process. This ember simply cools and the candle goes out completely. In trick candles however, they add an ingredient that ignites at a lower temperature then the paraffin wax. This ingredient is usually a pyrophoric metal. These metals are metals that ignite at extremely low temperatures. Magnesium is the most commonly used pyrophoric metal in trick candles, with the magnesium flakes embedded in the wicks. When you blow out the candle, the ember that remains is hot enough to light off the magnesium (needing only to be around 800 degrees Fahrenheit). When that magnesium burns, it burns so rapidly and at high enough temperatures that the paraffin wax vaporizes and ignites and the burning process continues. The obvious question then comes up. Why doesn’t all the magnesium in the wick light off when the trick candle is burning normally. The answer lies in how quickly the magnesium burns and how much oxygen is required to allow that process to occur. As the trick candle burns normally, the wick is cooled by the liquid paraffin wax. (similar to the way you can hold a paper cup full of water above a fire and the cup will not burn, because the water cools the cup) The barrier that the wax creates between the magnesium in the wick and the air also helps to keep the magnesium from lighting. But once the candle is blown out, the wick is exposed to the ember and more air, and voila! Fun for everyone, except asthmatics! A paraffin candle is easy to put out because only a tiny amount of wax is exposed to heat and therefore burns. Should an entire pool of liquid paraffin catch fire, it would be like any other hydrocarbon fire, like motor oil, and be extremely hard to put out. The most common firefighting method to put out a hydrocarbon fire is to layer the burning pool with a blanket of foam, thereby separating the oxygen in the air from the burning liquid. In a candle flame, a quarter of the energy created is released as heat, which radiates in many directions. Only about 4% of the candle’s heat goes into melting wax. Color can give us a clue as to the temperature of the candle flame. A light blue indicates approx. 1400 degrees Celsius and is the hottest part of a candle flame. As the flame cools, the color changes to yellow, then orange and finally red; red flame is usually around 800 degrees Celsius. Magnesium is the eighth most abundant element in the Earth’s crust. It makes up about 2% of the Earth’s mass. It is the ninth most abundant element in the known universe. There are three main “reaction zones” in a candle. The part where combustion starts is called the primary reaction zone. In the main reaction zone, the process of burning ends. The luminous zone is where the free carbon burns and releases light. > In trick candles however, they add an ingredient that ignites at a lower temperature then the paraffin wax. I’m not a native English speaker, but shouldn’t this be “than” instead of “then”? So HOW do you blow them out? Put a glass on it? I REFUSE TO BE CONNED! You could blow VERY hard and get them out. That separates the heat long enough to keep them out… Or I may have just spit on them (from blowing air that fast) and that’s how they went out.